Trustee’s column: Why is MCI so hard for some foundations? 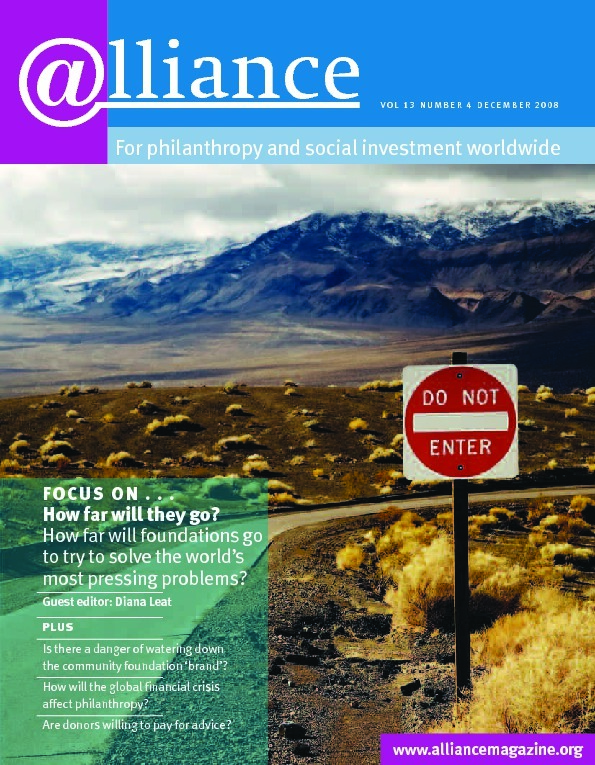 Sevdalina Rukanova’s article in the September issue of Alliance describes some of the problems foundations encounter in approaching mission connected investing – MCI. The idea of an investment that ‘targets a market rate of return and also helps a foundation achieve its mission’ makes unarguable good sense, so why don’t more foundations snap up this win-win opportunity? I think there are four issues here. First, what is a ‘market return’? In the investment world long-term return assumptions usually vary between a return on cash (around 5 per cent) and a private equity return (15 per cent). One of the key determinants of the return is the ease with which one can convert the investment back to cash: the more illiquid the investment, the higher the rate of return one would expect. But many MCI investments seem to be illiquid yet offer a similar return to cash. There is no compensation for the illiquidity, so the return is perhaps only a third of a ‘market’ return. Furthermore, investment managers like to keep cash levels in a portfolio at a consistent proportion, so a manager would take MCI from the illiquid assets (earning say 15 per cent) and not from the cash pool (earning 5 per cent). This means that the opportunity cost is a real cost. There is nothing wrong with this, but if MCI is represented as targeting market returns it undermines potential investor confidence when it simply isn’t true. An additional problem with MCI is the cost and difficulty of properly evaluating opportunities because there is such a small market for that advice, and many foundations are simply not prepared to pay that price. Second, why are other forms of investment so often seen as providing negative social returns when risk capital is vital in providing employment, social stability and economic wellbeing (imagine society without investment capital). Certainly there are problems (some significant) in the way many companies run their businesses, and engagement is a good way to address this. I have recently been surprised by the readiness of foundations to advocate MCI at the same time as investing heavily in ‘financial weapons of mass destruction’ such as CDOs, SIVs and CDSs, all of which enabled banks to lend so recklessly by selling on risk to hungry investors. The point is that all investments have some relationship with a foundation’s mission. I think this relationship is on the whole beneficial, but it can be negative and foundations should be alert to this. A small allocation to MCI does not remove this responsibility. Third, why do new foundations find MCI so much easier than older ones? Certainly there are more politics to navigate in older foundations, not least because they have developed elaborate processes (as required by law) to allow delegation while new foundations often retain the spontaneity of their creation. Doubtless improvements could be made at established foundations and the Rockefeller Philanthropy Advisors’ guide provides welcome practical advice for trustees. However, traditional grantmakers will expect an investment to be less risky than a grant – everyone agrees that ‘investment’ does imply some financial return. Perhaps this is where MCI can be clear. A foundation should not compromise on returns for MCI but can be more tolerant of failure. For example, a medical research charity might fund biotech start-ups. These can be very risky: while potential returns can be vast so can losses. But in science discovering that something doesn’t work is a useful outcome, and someone needs to take that risk. But is the converse true: can foundations accept sub-market returns instead (ie an investment with a grant element in it)? Yes, of course, but only by sacrificing the clarity of the return objective for a more intangible and opaque social benefit. Without such a benchmark trustees will find it difficult to assess whether a financial or a social return would be more cost-effective. Fourth, who is best placed to carry risk? A feature of MCI is that risk of default is passed from funder to recipient. A foundation has a much larger risk tolerance than a smaller enterprise so there must be moral questions about this. But does this transfer of risk really take place? In the case of an investment, a foundation must be prepared to foreclose on a borrower in the event of default; the investor’s main risk is that there will be insufficient funds to repay the investment. If the trustees are not prepared to foreclose on the borrower to recover its asset, then was the loan simply a grant with some upside? Foundations should be careful that MCI is indeed an investment and not a grant by another name. What we need is a balanced, thoughtful and rigorous debate about the moral use of all a foundation’s capital. 1 Sargon Nissan and Margaret Bolton (Spring 2008) Mission Possible: Emerging opportunities for mission connected investment nef. 2 Mission Related Investing: A policy and implementation guide for foundation trustees Rockefeller Philanthropy Advisors, 2008.